Dr. Auerbach and Dr. Thomas are now offering Bladeless Laser Assisted Cataract Surgery with Alcon's LenSx® laser. The LenSx® laser brings a new level of customization to cataract surgery, allowing each procedure to be specifically tailored to patient anatomy and surgeon preference. Although cataract surgery is considered to be one of the safest and most successful procedures performed in medicine today, laser cataract surgery improves the precision of many key surgical steps to provide possibly better outcomes and potentially make cataract surgery even safer. The LenSx® is a femtosecond laser, which emits cool pulses with durations between a few femtoseconds and hundreds of femtoseconds. For nearly a decade, femtosecond lasers have helped surgeons perform LASIK with unparalleled precision and accuracy. Designed to revolutionize key steps in the cataract procedure, the LenSx® Laser now allows surgeons perform cataract surgery that is more precise, predictable and reproducible. What does the LenSx® laser do? LenSx® automates the most challenging steps of traditional cataract surgery, such as performing corneal incisions, opening the capsule and softening and breaking up the cataract. 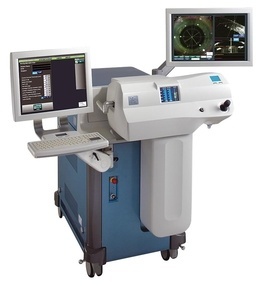 Prior to the introduction of this laser, traditional cataract surgery involved the creation of several small incisions made manually with a blade. With LenSx®, the surgeon can create those incisions with the laser, resulting in a significantly higher degree of precision. Also the advanced imaging systems provides both real-time video as well as three-dimensional visualization, enabling the surgeons to custom design a treatment plan that is individually tailored for your eyes. In traditional cataract surgery, the eye surgeon uses a hand-held metal or diamond blade to create an incision in the area where the sclera meets the cornea. The goal in creating this incision is to go a partial depth vertically, then go horizontally in the cornea about 2.5 mm and then enter into the eye. Then the surgeon can break up and remove the cataract, which is located right behind the pupil. Next an intraocular lens (IOL) is inserted and implanted, to replace the cloudy natural lens. The reason cataract incisions are created in a two- or three-plane fashion is so they will self-seal when surgery is complete, allowing for a no-stitch approach. With the laser approach to cataract surgery, the surgeon creates a precise surgical plan with a sophisticated 3-D image of the eye called an OCT (optical coherence tomography). The goal is to create an incision with a specific location, depth and length in all planes, and with the OCT image and a femtosecond laser, it can be performed exactly without the variable of surgeon experience. This is important not only for accuracy but also for increasing the likelihood that the incision will be self-sealing at the end of the procedure, which reduces the risk of infection.